The below artworks are the most important by Joan Miró - that both overview the major creative periods, and highlight the greatest achievements by the artist. Artwork description & Analysis: A dramatically tilted picture plane presents a view of the artist's masia or "family farm," thronging with animals, farm implements, plants, and evidence of human activity. Miró explained, "The Farm was a résumé of my entire life in the country. I wanted to put everything I loved about the country into that canvas - from a huge tree to a tiny snail." The intensity of vision and almost maniacal attention to detail gives the work the quality of an eidetic memory, reconfigured in a dream, and prefigures his later Surrealist work. As art critic Laura Cummings wrote, "every entity is given its own autonomous space in the picture, separately praised but connected by rhyming shapes," due to the "quasi-cubist space, tilted upright; and presumably because Miró is celebrating the thriving upward growth of home." The work illustrates important innovations signature to the artist as it includes various abstracted elements, like the black circle where the eucalyptus tree rises in the center, symbols like the two ladders, one with a goat standing on top, and the other with a rooster. Furthermore, as Cummings notes, in "his new way of painting... objects have a double life as letters - the E of a crate, the A of a ladder, the O of wheel, pail and sun - and everything is simultaneously inside the scene and written on its surface. The Farm is both picture and poem." The artist considered this work among his most important, marking a turning point. While reflecting a number of influences, including Catalan folk art, a Romanesque sense of hierarchy where scale reflects importance, and a Cubist vocabulary, the work resisted settling into a style, exemplifying the artist's restless and iconoclastic approach. After completing the work, Miró struggled to find a buyer in a Parisian modern art market that preferred Cubism. One dealer suggested cutting it into several smaller paintings for ease of sale. Fortunately, the artist had become friends with the writer Ernest Hemingway, then a struggling unknown, and, after hours of working the two would meet for boxing sessions to unwind. Hemingway was determined to buy The Farm and, after borrowing money and working as a grocery clerk, was able to purchase it and kept it throughout his life. As he wrote, "I would not trade it for any picture in the world. It has in it all that you feel about Spain when you are there and all that you feel when you are away and cannot go there." Artwork description & Analysis: This painting depicts a festive and crowded scene where quixotic biomorphs seem to be caught up in a lively celebration. Every form both evokes resemblances and refuses them, as at center left, the harlequin, identified by the black and white checks of the costume of the Italian commedia dell'arte's stock figure, has a body shaped like a distorted guitar. The cat, at lower right, stands up on its hind legs, as if dancing, its "arms" held out to the scene, while its red and yellow face turns to look at the viewer. A yellow and black fish lies on the table, an ear and an eye grow out of the ladder on the left, music notes appear on the wall, black and white snakelike tubes cross in the center, and many of the forms are connected by thin scrolling lines, as the black and yellow creature dancing in the lower center grasps a thread that extends to the cat's whiskers. The viewer is caught up in this imagined world, intrigued by the dissonance between identification and meaning. An early example of the artist's turn toward Surrealism, this work also pioneered his use of biomorphic forms, as most of the objects evoke living organisms. He explained some of the painting's symbolic meaning, saying that the black triangle symbolized the Eiffel Tower and the ladder stood for both elevation and evasion. Yet the merging and melding forms overturn the certainties of the conscious world, including those of art, as the artist said, "I'm only interested in anonymous art, the kind that springs from the collective unconscious." Miró never wanted to settle into a particular artistic style and strove to overturn aesthetic hierarchies. In this work he created his own pictorial idiom. 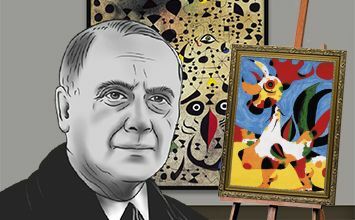 As art critic Laura Cummings wrote, "When Miró died in 1983, at the age of 90, he had long been cherished as the last of the modernist stars. His pictorial language was singular, instantly recognizable and - quite rightly - no longer perceived as some Catalan dialect of Surrealism." Artwork description & Analysis: In a spare landscape that is both Surrealistic and humorously cartoonish, divided between rich chocolate earth and a black night sky, a whimsically distorted dog, depicted in bright colors, barks up at the moon above him. On the left, a ladder, depicted in white and yellow with red rungs, extends into the sky. The distortions of the moon and the dog, along with the improbability of the ladder, create a sense of play where everything both is and is not what it seems, while the white, red, and yellow, used for the four forms, creates some mysterious sense of connection between them. As art critic Laura Cummings wrote, "On the ground, a multicoloured critter with something like paws and jaws barks at the moon with all the energy implicit in its tightly sprung form. The moon is not quite immune to this absurd display: it has a painted heart. But it also wears a satirical red nose." Yet the vast space, filled by the dark background, also evokes a sense of deep loneliness and mystery, as art critic Judith Flanders wrote, "At his best, in works like Dog Barking at the Moon, he created a mysteriously floating, unanchored world where his standard lexicon of symbols - here the ladder, symbolising not only individuality and escape, but also futility and an exit into the void of death - become potent." In the period preceding this work, the artist had begun sometimes including words in his paintings, creating what he called "painting poems." The original sketch included the moon's response to the dog in Catalan, "You know, I don't give a damn." Though Miró left the text out of the painting, a feeling of implicit communication remains, created by the dog's insistence, its body lifting with its unheard voice, and by the moon, visually, seeming to turn away in rejection. As Cummings noted, the work famous "as a work of surrealism...has equally been interpreted a personal manifesto. Here is the young artist as a pup, trying to find his voice in the international avant-garde. The beautiful ladder must therefore be his art, by which he will ascend." Artwork description & Analysis: This painting is based on Hendrick Martensz Sorgh's Lute Player (1661), a Dutch Golden Age genre painting showing a domestic interior where a young man with a small dog at his feet serenades a young woman who seems unimpressed, as a cat looks out from under the table. Here, the young woman is left out and the lute player becomes a biomorphic shape with a red circular face surrounded by a large white circular collar, a curlicue swirl of lines for hair, as he plays the lute that diagonally intersects the center of the canvas. The white of the collar extends to the right in angles and curves, and resembles a kind of oversized leg painted with small ambiguous symbols, a dark pyramid for genitalia next to a sperm like shape, a black crescent shoe at the "foot." Miró's dog echoes the original but has a bone shaped body. As art critic Karen Rosenberg wrote, "presences become floating, Surrealist apparitions - unmoored and ambiguous but still mischievous," becoming "a giddy fantasia in green and orange, with the lute player as a kind of Pied Piper to various birds and beasts." This work is the first in a series of three that the artist painted after visiting the Netherlands for the first time in 1928. The same year, following a very successful exhibition of his work in Paris, the artist said, "I understood the dangers of success and felt that, rather than dully exploiting it, I must launch into new ventures." When he subsequently went to Brussels for an opening of his friend Hans Arp's work, he took the opportunity to visit the leading Dutch museums where he wrote, he was "seduced by the ability of the Dutch painters to make dots as tiny as grains of dust visible and to concentrate attention on a tiny spark in the middle of obscurity." Taken particularly with Hendrick Sorgh's Lute Player (1666) and Jan Steen's Children Teaching a Cat to Dance (1660-1679), two notable genre paintings, he bought two postcard reproductions and returning to his family's farm near Barcelona began painting. As Rosenberg wrote, "In bold, flat colors that rejected the naturalistic modeling and perspective of seventeenth-century Dutch painting, Miró greatly accentuated some elements of Sorgh's composition...while diminishing others." The three works became radical explorations of what art historians Panda de Haan and Ludo Van Halem called the artist's "mirómorphosis" and, after finishing them, Miró wrote, "When I finish a work, I see in it the starting point for another work. But nothing more than a starting point to go in a diametrically opposite direction." Artwork description & Analysis: This painting uses a reduced palette to present many small blue, green, yellow, red, and predominantly black forms that resemble signs, globes, stars, and eyes that populate the opalescent, tawny background. While searching for the lovers and the bird, viewers are drawn further in by the plethora of lines that connect them, woven into a complex constellation against a night sky. As art historian Laurie Edison noted, "Unlike stars, which exist physically in the sky, constellations exist only conceptually... we are the ones who conceptualize invisible lines between stars to connect them to each other, " and, as a result the work, like "the function of constellations," reveals "a shape that is a pure construct." That construct reveals as art critic Tim Adams wrote, "the most vibrant expression of Miró's inner universe," his deep sense of inner connection. In 1939 with the outbreak of the war, Miró fled Paris with his family to Normandy. The small village was often in a state of blackout. He wrote, "I had always enjoyed looking out of the windows at night and seeing the sky and the stars and the moon, but now we weren't allowed to do this any more, so I painted the windows blue and I took my brushes and paint, and that was the beginning of the Constellations." This work is part of a series of 24 paintings on paper upon which Miró innovatived his own language of signs to help him cope with the difficult life circumstances. He said, "When I was painting the Constellations, I had the genuine feeling that I was working in secret, but it was a liberation for me in that I ceased thinking about the tragedy all around me." Miró considered the series among his most important works, and they indeed became his most influential. His ability to bring forth illustrative form to his emotions laid a great foundation for the ensuing Abstract Expressionist movement. The series also inspired André Breton's series of prose poems Constellations (1958). As the critic David Sylvester once said: "Miró's art may well have been the most far-reaching single influence the American Abstract Expressionists had. It is reflected in Pollock and Gorky, Gottlieb and Baziotes, Motherwell and Smith. And is there any influence other than his that has been common to both de Kooning and Rothko?" Artwork description & Analysis: This monumental canvas, nearly 12 feet by 9 feet, part of a series of three, uses simple abstract shapes against a blue background, painted with uniform brushstrokes. A slightly diagonal red stroke adds dramatic contrast, emphasizing the infinite and vacant expanse, while a series of black, irregularly round shapes, evokes a private language of signs, energetically extending across the horizon. Miró often used a blue field in his work, as he identified the color not only with the vast sky, but also with the world of dreams, as seen in his Photo: This Is the Color of My Dreams (1925). The intense blue dominates, capturing the artist's feeling as he wrote, "The spectacle of the sky overwhelms me. I'm overwhelmed when I see, in an immense sky, the crescent of the moon, or the sun. There, in my pictures, tiny forms in huge, empty spaces. Empty spaces, empty horizons, empty plains - everything which is bare has always greatly impressed me." His Bleu series was painted at a time when he was internationally famous and the enormous scale of the three canvases were a kind of artistic statement, a tour de force. Miró's work influenced the Abstract Expressionists and, particularly, the Color Field painters, and some critics view this monumental series as reflecting those movements' subsequent influence upon him. But at the same time, the work also draws upon his lifelong preoccupations and ancient sources, as he said, "Little by little, I've reached the stage of using only a small number of forms and colors. It's not the first time that painting has been done with a very narrow range of colors. The frescoes of the tenth century are painted like this. For me, they are magnificent things." Artwork description & Analysis: This sculpture depicts a hybrid creature, its face and horns lunar shaped, while its two arms resemble the arc of wings, but are devoid of plumage. Its squat horizontal torso with two limbs firmly planted has a primal power, as if drawing strength from the earth. The many hornlike shapes not only evoke crescent moons and birds, but the tradition of Spanish bullfighting. The work becomes a powerful totem, as art historian Carmen Fernández Aparicio wrote, "Miró brought together metaphorical mineral forms and ideas from the natural and cosmic world to create a strange, hybrid character, a sort of monster with a shining, polished surface." Sculpture allowed Miró to embody his long-time preoccupations, as here, the moon, the bird, and the theme of Catalonia, fuse into one iconic and idiosyncratic three-dimensional form. Miró turned to sculpture in the 1940s, feeling as he said, "It is in sculpture that I will create a truly phantasmagoric world of living monsters; what I do in painting is more conventional." He molded the works by hand, as this work, created in 1946-49, shows in its soft contours and sensitive modeling. As a result, the work seems to have sprung out of the natural world, resembling an organic form that has taken shape in dark shining metal. In the 1960s, he enlarged the original model to make casts of the work, which can be found in museums and sculptural parks throughout the world. Artwork description & Analysis: This bronze sculpture depicts a figure, whose biomorphic shape evokes vegetable forms, flower petals, and marine-like flippers. The creature's head, elongated horizontally, has prominent sunken eyes, bordered with curvilinear incisions, that seem to stare out poignantly from a kind of cosmic space, evoking an encounter with the extraterrestrial. Yet the arms, legs, torso, neck, and genitalia also evoke the human, whimsically reconfigured to both intrigue and challenge the viewer. This personage, or notable character, from what the artist called his "truly phantasmagoric world of living monsters" evokes humanity's common condition as both organically formed from nature yet also alienated from it. Miró was first known for creating these bizarre creatures through his "dream paintings," which were made in an automatic state, driven, as he said, by hallucinations due to hunger. He first explored this theme in paintings like Personage (1925), where a ghostly balloon-like figure hovered in an ethereal blue and undefined space. Evoking the psychological concept of the persona, or social mask, the artist said, "Wildness is the flip side to my character - I'm well aware. Naturally, when I'm with people, I can't be brutal in speaking and I put on, one might say, a kind of mask." Yet in his art, a kind of wild play allowed him to mock his own personages, "Mocking man, that puppet which cannot be taken seriously." Nonetheless, the figure here, evolved into sculptural form, has a totemic dignity, evoking a being of note, invented but otherworldly, as it transforms the space of its display into a space of improbable encounter. Miró's personages influenced later artists including Robert Motherwell and Louise Bourgeois. Artwork description & Analysis: This monumental sculpture, standing 66 feet tall, depicts a woman, her massive form painted in bright primary colors, wearing a tubular "hat" topped with a yellow bird that evokes a crescent moon. Yet the work is ambiguous, its phallic shape informing the viewer's initial impression. As a result, the viewer has to pause and interpret the work, thus, entering the artist's interior iconography, where woman symbolized the earth, the moon symbolized the heavens, and birds were meditators connecting the two realms. Due to its massive size, it becomes a kind of talisman for Miró, a public statement embodying the motifs he developed in his Constellations series (1939-41) and evolved throughout his career. The sculpture, built of colorful, broken ceramic tiles, was one of the first major public art initiatives in Barcelona, following the re-establishment of democracy, and is considered Miró's last great work. The use of mosaic and irregular contours were a kind of homage to Barcelona's great architect Antonio Gaudi, with whom Miró had studied. Evoking the colossal statues that stood at the entrance of ancient Greek cities, marking sacred spaces, the work rises out of a large reflecting pool in the Parc de Joan Miró, which is also populated with 30 other sculptures by the artist.